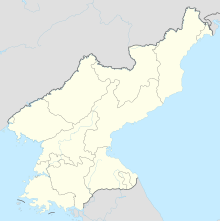 Changjin-up Air Force Base is a military airport in Changjin, South Hamgyong, North Korea. The airfield has a single concrete runway, 16/34, which measures 9170 x 203 feet (2795 x 62 m). It has a full length parallel taxiway. Where a squadron of IL-28 Russian jet bombers are based. This article about an airport in North Korea is a stub. You can help Wikipedia by expanding it.